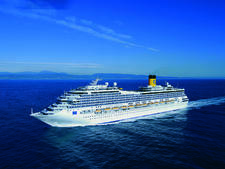 Costa Deliziosa, a twin to Costa Luminosa, is a warm, whimsical ship with a simple layout that's easy to navigate. 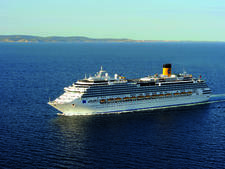 The 92,600-ton, 2,260-passenger ship, which debuted in February 2010, represents a "retro-style evolution" for Costa Cruises. What do we mean by that? 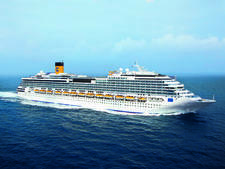 While the Italy-based and European-influenced cruise line has been producing mega-ships like the 114,500-ton, 3,000-passenger Concordia-class ships (Costa Serena, Pacifica, Favolosa and Fascinosa) and the 132,500-ton, 3,724-passenger Costa Diadema, it has also been building ships like Deliziosa -- and Luminosa, too -- with a smaller design. The sister ships are actually built to Panamax specifications, which means they're not only smaller than many of their fleetmates, but they're more flexible, too. Since Deliziosa can slide through the Panama Canal, it has more itinerary possibilities, and, indeed, it's been doing annual world cruises since 2011. 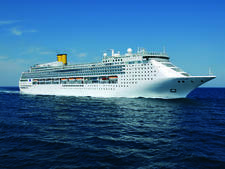 Costa Deliziosa's slightly smaller, more manageable size does not preclude it from offering all of Costa's mega-sized features and amenities, from vast spa facilities and kids club to its Grand Prix driving simulator and extensive entertainment options. 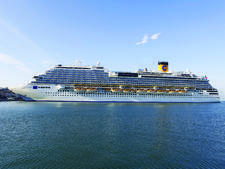 And nifty self-service screens, called totems, let you check your onboard account, make restaurant reservations, learn about the crew, figure out what's in the daily program and book spa treatments from public areas without having to find your way back to your cabin. 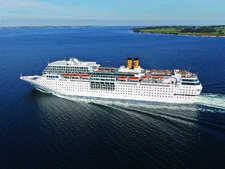 While Costa attracts a largely European clientele, it's actually part of the Carnival Corporation, and the ship most resembles Carnival Cruise Lines in its design and in its layout. (Its jazzy interiors are created by Joe Farcus, a longtime Carnival decorator, yet there's a little bit of Holland America in its layout, such as a similar main pool design). 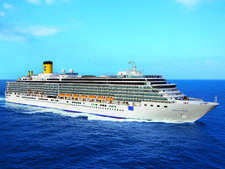 We're not convinced that travelers wanting a European ambience onboard will find Costa Deliziosa notably more upscale and sophisticated than the ships in the fleet's Concordia class. The neon signage in public spaces simply screams "mass market," for example. Where Deliziosa shines is in its size -- it's big enough to offer dining choices, a handful of pools, and plenty of options in entertainment and recreation. But it's not so large that it can't pass through the Panama Canal. 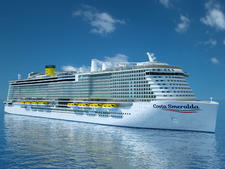 That means it can offer far more daring, interesting and exotic itineraries than its mega-ship counterparts. 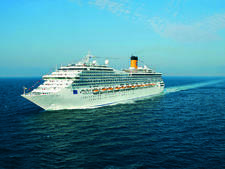 Deliziosa's Mediterranean itineraries attract cruisers of all ages, and summers see lots of families onboard. 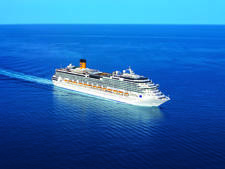 The world cruises attract an older demographic, with an average age of about 65, and travelers are typically retired and affluent. 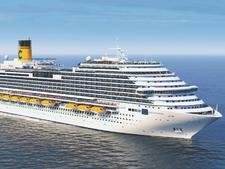 Italians are the biggest nationality onboard, followed by Germans, French, North Americans and Asians. Most nights are informal, with "resort wear" appropriate; jackets are not required. There are one or two gala evenings per European sailing, depending on length. Suits for men and cocktail dresses for women are recommended. 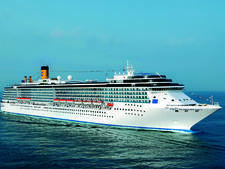 The cruise line suggests passengers not wear beach clothes and shoes (shorts, sarongs or flip-flops) in restaurants. Though Costa does not reference jeans directly in its written policy, denim is allowed in the dining room. The onboard currency is the euro. 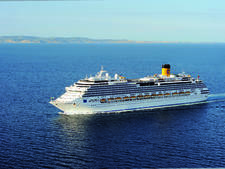 For world cruises aboard Costa Deliziosa, the service fee is 7 euros per person 15 years of age and older, per day. 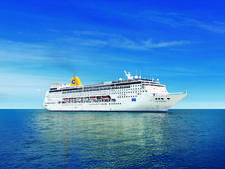 In Europe, there is a charge of 8 euros per person age 15 and up, per day, for all cruise lengths.